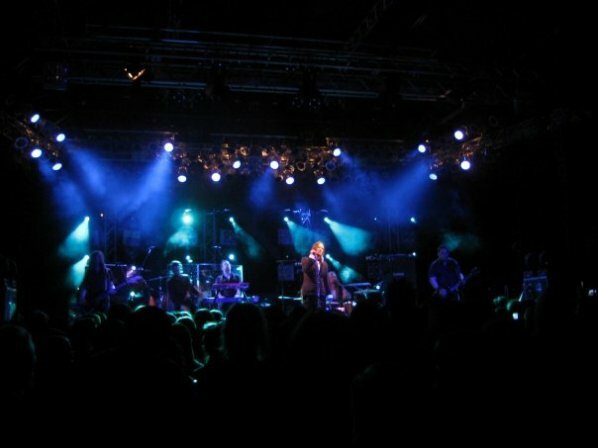 Fan-filmed video footage of HIM's December 27, 2008 performance at Nosturi in Helsinki, Finland can be viewed below. The concert was the launch event for the fourth annual Helldone Festival, which is taking place December 27 and December 29-31, 2008 at various clubs in Helsinki, Oulu and Tempere Finland. During the past couple of years, the Helldone Festival has been proud to present some cool bands from overseas but the fans have politely pointed out that the thing they really want to see and hear are Finnish bands. Finnish bands in the dark heart of the Finnish winter. Some of this year's bands have played at the festival before but none has been invited back purely for old times' sake. Each and every band in the Helldone 2008 lineup has recently reached important milestones in their careers: be it a killer album, a breakthrough in new territories or a big tour. They all are alive, hungry, fast and furious. And definitely as cool as a December night in downtown Hellsinki. Helldone 2008 marks the tenth anniversary of HIM's New Year's Eve shows at Tavastia Club — the tradition out of which the Helldone Festival was born. Each night there will be three top bands on the Tavastia stage, while the neighboring venue Semifinal serves as a chill out zone with some familiar faces spinning records. HIM will traditionally start their set at midnight on New Year's Eve. For more information, visit www.myspace.com/helldone.